Soriano began his professional career with Hiroshima in 1996, but signed with the Yankees as a free agent in 1998 and was assigned to play in minor league baseball. The next year, he was the Most Valuable Player (MVP) in the All-Star Futures Game, and made his MLB debut. The Yankees traded Soriano to the Rangers after the 2003 season, and the Rangers traded Soriano to the Nationals after the 2005 season. He signed a contract as a free agent with the Cubs before the 2007 season. The Cubs traded Soriano to the Yankees in 2013, and the Yankees released him in 2014. Soriano is one of only 51 major league players to hit 400 or more career home runs, and was seventh among active players in home runs at the time of his retirement. In 2002, Soriano became the second Yankee in franchise history to record 30 home runs and 30 stolen bases in the same season (the first being Bobby Bonds in 1975), then repeated the feat in 2003. Also in 2002, he led the American League with 696 at bats, 209 hits, 92 extra base hits, 41 stolen bases, 128 runs and set a Yankees' team record for most at bats (696) and most strikeouts (157) in a season. He is one of only six players active as of 2009 who finished a 30-homer season with more homers than walks (39 HR, 23 BB), the others being Ryan Braun (34–29 in 2007), Garret Anderson (35–24 in 2000), Ivan Rodriguez (35–24 in 1999), Joe Crede (30–28 in 2006), and José Guillén (31–24 in 2003). ^ Coskrey, Jason (November 8, 2014). "Fateful decision in Japan put Soriano on path to MLB". ^ Nightengale, Bob (May 14, 2002). "Soriano makes difficult game seem easy". ^ "Yankee Farmhand helps beat U.S.". Herald Journal (Google News). Associated Press. July 11, 1999. Retrieved November 7, 2014. ^ "Jayson Stark: Raul Ibanez on a Sandwich Award-winning roll". espn.go.com. Retrieved November 13, 2011. ^ "Selig gives blessing to mega-merger". ^ Sanchez, Jesse (February 16, 2004). "A-Rod-for-Soriano trade completed". ^ "Rangers, Tigers combine for 18-run inning". ^ Newman, Mark (July 14, 2004). 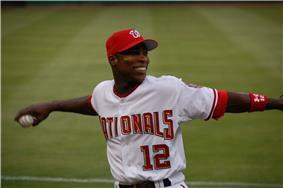 "Soriano all smiles as All-Star MVP". ^ "Rangers trade Soriano to Nationals for three players". ^ Ladson, Bill (February 10, 2006). "Soriano loses arbitration case". ^ Ladson, Bill (July 23, 2006). "Kasten wants Soriano to stay". ^ "Elias Says ...". espn.go.com. August 26, 2006. Retrieved November 13, 2011. ^ Svrluga, Barry (September 12, 2006). "Offensive Production Masks Solid Defense". The Washington Post. Retrieved April 23, 2010. ^ "Soriano first ever to reach 40–40–40 mark". Associated Press. Retrieved July 31, 2007. ^ Bill Ladson / MLB.com (January 1, 2011). "The Official Site of The Washington Nationals:Washington Nationals News". Washington.nationals.mlb.com. Retrieved November 13, 2011. ^ Bill Ladson / MLB.com (January 1, 2011). "The Official Site of Major League Baseball: Major League Baseball News". Mlb.mlb.com. Retrieved November 13, 2011. ^ Boswell, Thomas (August 1, 2006). "The Left Fielder Stays in the Picture". The Washington Post. ^ a b Muskat, Carrie, Cubs complete blockbuster with Soriano (November 20, 2007), MLB.com, Retrieved on August 6, 2007. 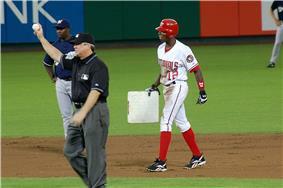 ^ Muskat, Carrie, Piniella considering Soriano in center (January 20, 2007), MLB.com, Retrieved on August 6, 2007. ^ Wittenmyer, Gordon, Future could be now; Soriano's hamstring injury could mean top (April 17, 2007), Chicago Sun-Times, Retrieved on August 6, 2007. ^ a b c d Yahoo! Sports, Alfonso Soriano – Chicago Cubs – Game Log (2007), Retrieved on August 6, 2007. ^ Odum, Charles, Chi Cubs 9, Atlanta 1 (June 8, 2007), Yahoo! Sports, Retrieved on August 6, 2007. ^ ESPN.com, Cubs' Soriano smashes 3 homers in first four innings (June 8, 2007), Retrieved on August 6, 2007. ^ Gano, Rick, Chi Cubs 3, Chi White Sox 0 (June 24, 2007), Yahoo! Sports, Retrieved on August 6, 2007. ^ Crawly's Cub Kingdom, Gotta Love it – Sunday-Cubs 3 White Sox 0 (June 24, 2007), Retrieved on August 6, 2007. ^ Schwartz, Michael, Soriano named Player of the Month (July 2, 2007), MLB.com, Retrieved on August 6, 2007. ^ MLB.com, Rosters: By League, Retrieved on August 6, 2007. ^ ESPN.com, MVP Ichiro hits All-Star Game's first inside-the-park homer (July 10, 2007), Retrieved on August 6, 2007. ^ Muskat, Carrie, Soriano homers twice as Cubs win (July 28, 2007), MLB.com, Retrieved on August 6, 2007. ^ a b Gano, Rick. Cubs' Alfonso Soriano out up to a month weeks after injuring quad running the bases against the Mets (August 5, 2007), Yahoo! Sports. Retrieved on August 5, 2007. ^ Wittenmyer, Gordon. Jones, Cubs rock on (August 11, 2007), Chicago Sun-Times. Retrieved on August 22, 2007. ^ a b Muskat , Carrie. Notes: Running encourages Soriano (August 21, 2007), MLB.com. Retrieved on August 22, 2007. ^ Wittenmyer, Gordon, Soriano return set for Tuesday (August 27, 2007), Chicago Sun-Times, Retrieved August 27, 2007. ^ Associated Press, Soriano's lead off homer sets major league record, ties Cubs mark for September (September 28, 2007), Sporting News.com. Retrieved on October 21, 2007. ^ Yahoo! Sports, 2007 Chicago Cubs Statistics. Retrieved on October 27, 2007. ^ Muskat, Carrie (May 3, 2008). "Cubs' comeback comes up short". ^ Muskat, Carrie (May 25, 2008). "Cubs have Sun-day blues vs. Bucs". ^ "Cubs lose Soriano to broken left hand in 7–2 win over Braves". ^ "Holliday to replace Soriano in NL All-Star lineup". ^ Muskat, Carrie (August 22, 2008). "Cubs stunned by Nats' late rallies". ^ "The Official Site of Major League Baseball | Homepage". Mlb.mlb.com. Retrieved November 13, 2011. ^ "Chicago Cubs vs. Milwaukee Brewers – Recap – April 11, 2009". Espn.go.com. April 11, 2009. Retrieved November 13, 2011. ^ "Chicago Cubs vs. Milwaukee Brewers – Box Score – April 12, 2009". Espn.go.com. April 12, 2009. Retrieved November 13, 2011. 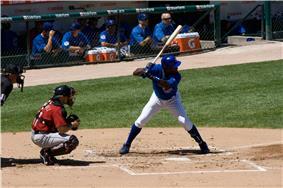 ^ "Alfonso Soriano Stats, Splits – Chicago Cubs". Sports.espn.go.com. January 7, 1976. Retrieved November 13, 2011. ^ Sherman, Brad (July 5, 2009). "Victorino on All-Star ‘Final Vote’ ballot – Mauinews.com | News, Sports, Jobs, Visitor's Information". The Maui News. Retrieved November 13, 2011. ^ "Full speed will be test for Soriano's knee". Espn.go.com. Retrieved February 14, 2013. ^ "MLB Player Fielding Stats – As lf – 2009". Espn.go.com. Retrieved November 13, 2011. ^ "2010 Regular Season MLB Baseball LF Fielding Statistics". Espn.go.com. Retrieved November 13, 2011. ^ "2011 Regular Season MLB Baseball LF Fielding Statistics". Espn.go.com. Retrieved November 13, 2011. ^ "Alfonso Soriano Stats". Espn.go.com. Retrieved February 14, 2013. ^ "Yankees acquire Soriano from Cubs". NY Post. Retrieved 26 July 2013. ^ "Mariano Rivera blows third straight save but Brett Gardner lifts Yankees". ESPN.com. Associated Press. August 11, 2013. Retrieved July 7, 2014. ^ Corcoran, Cliff (August 15, 2013). "Alfonso Soriano's hot hitting results in RBI first as Yankees stomp Angels". SportsIllustrated.com. Retrieved July 7, 2014. ^ "Alfonso Soriano has 18 RBIs in last 4 games; Yankees top Red Sox". espn.com. August 16, 2013. Retrieved August 20, 2013. ^ "Alfonso Soriano of the New York Yankees named the American League Player of the Week". Major League Baseball. Retrieved August 19, 2013. ^ "Alfonso Soriano Statistics and History". Baseball Reference. Retrieved July 7, 2014. ^ Axisa, Mike (July 6, 2014). "Yankees designate Alfonso Soriano for assignment". CBSSports. Retrieved July 6, 2014. ^ "Yankees designate Alfonso Soriano for assignment". ESPN.com. Associated Press. July 6, 2014. Retrieved July 7, 2014. ^ Green, Will (July 14, 2014). "Yankees release seven-time All-Star Alfonso Soriano". si.com. Retrieved July 14, 2014. ^ a b "Alfonso Soriano says he is retiring". ESPN.com. Associated Press. November 5, 2014. Retrieved November 6, 2014. ^ Cruz, Héctor J. "Miniaturas del béisbol: Más de Haitianos". Listin Diario. Retrieved 22 January 2015. ^ "Sus éxitos en el béisbol no lo apartan de sus raíces". Listín Diario (in Spanish). November 12, 2010. Retrieved December 7, 2014. With the signings of Carlos Beltran and Jacoby Ellsbury, Soriano started the 2014 season as the designated hitter and sometimes played at right field. His playing time became limited as he struggled at the plate. Soriano was designated for assignment by the Yankees on July 6, 2014. He was released on July 14. In 67 games, Soriano batted .221 with 6 home runs and 23 RBI. From August 13 to 16, Soriano batted in 18 runs over four games, tying the Major League record for most RBI in four consecutive games. Soriano also recorded 13 hits during this stretch, becoming the only player in MLB history with 18 RBI and at least 12 hits in a four-game stretch. The other players who have recorded 18 RBI in four games are Jim Bottomley (St. Louis Cardinals, July 6—9, 1929), Lou Gehrig (New York Yankees, July 29–31, 1930), Tony Lazzeri (New York Yankees, May 21—24, 1936), Joe DiMaggio (New York Yankees, August 28—September 1, 1939), and Sammy Sosa (Chicago Cubs, August 8—11, 2002). Soriano was named the AL Player of the Week for August 12–18. On August 13, 2013, Soriano hit two home runs and had a career-high six RBIs. The next day, he broke his career high set the previous day by driving in seven RBIs. He became one of only three players in the live-ball era to drive in at least six runs in back-to-back games (the other two being Geoff Jenkins in 1997 and Rusty Greer in 2001). He also became just one of seven players to record 13 RBI in a two-game span, and fell just two RBI short of the all-time record set by former Yankee Tony Lazzeri. Shortly before the All Star break, manager Lou Piniella dropped Soriano in the batting order and made it clear that it was not a temporary change. For the first time in his career, Soriano seemed to accept not being a leadoff hitter and actually praised his manager for making the necessary decision, citing the fact that "I'm not doing my job." 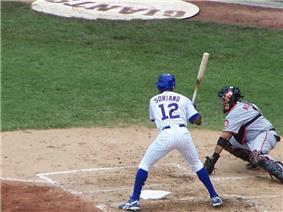 On September 16, 2006, Soriano stole second base in the first inning to become the fourth player to join the 40–40 club, after José Canseco, Barry Bonds, and Alex Rodriguez. Six days later he became the first player to reach 40 home runs, 40 stolen bases and 40 doubles in one season.